Three bottles of tasty Alley Kat beer, chiling in the great outdoors. It’s New Year’s Eve, and some of your thoughtful pals have brought over several cases of beer as an offering of festive cheer. Problem is, there’s no room in the fridge, and you’re looking to enjoy the brewskis sooner rather than later. What’s a guy/gal to do? I live in Canada, nature’s greatest natural beer cooler. I sure as hell know what I’m going to do: tap into the great outdoors. Because I’ve always secretly wanted to be a scientist, I propose a test. Which method is the fastest way to cool down a few beers? Stuffing them in the freezer? Leaving them in the air outside? Burying them in a snow bank? Add to that an extra test. Fan of Mythbusters that I am, I picked up a trick about using salt and ice water to rapidly cool down frosty beverages in a pinch. Adapted to this test, I filled a tub with snow, jammed some beer bottles in it, then poured in a solution of one cup table salt and eight cups water. As the snow melted, I added more snow to the top. Before we get started, a few numbers. The temperature outside during the tests was -16 degrees Celsius (3.2 Fahrenheit), a fairly chilly winter evening. The temperature in my freezer is -13.5 degrees Celsius (7.7 Fahrenheit), not unexpected for a fridge/freezer as old as mine is. The beer’s starting temperature was around 15 C (59 F), as it was stored near a wall in my drafty apartment building. After 30 minutes: 8.6 C (47.5 F) — Not very cold yet. Clearly needs more time. After 45 minutes: 5.5 C (41.9 F) — Much better. After 60 minutes: 0.5 C (32.9 F) — Perfect! Pros/cons? : Limited freezer space means you’re limited in how much beer you can chill at once. Results weren’t as quick as I was expecting. After 30 minutes: 5.2 C (41.4 F) — Already pretty cold. After 45 minutes: -0.9 C (30.4 F) — Perfect. Absolutely perfect. Just colder than freezing. After 60 minutes: -2.5 C (27.5 F) — After popping the cap, the beer turned into a beer slush. Refreshing, yes, but also getting into dangerous bottle-freezing territory. Pros/cons? : Big benefit here is how simple it is. Take a case of beer, deposit outside, set iPhone timer, come back and collect cold beer. Amazing. Con? Someone could pinch your exposed case of beer. Note that walking home from the beer store with a six-pack in hand likely has a similar cooling effect. After 30 minutes: 7.5 C (45.5 F) — Cold enough to be drinkable, but not ideal. After 45 minutes: 4.1 C (39.4 F) — About fridge temperature. Perfectly drinkable. After 60 minutes: 3.4 C (38.1 F) — Just about right. 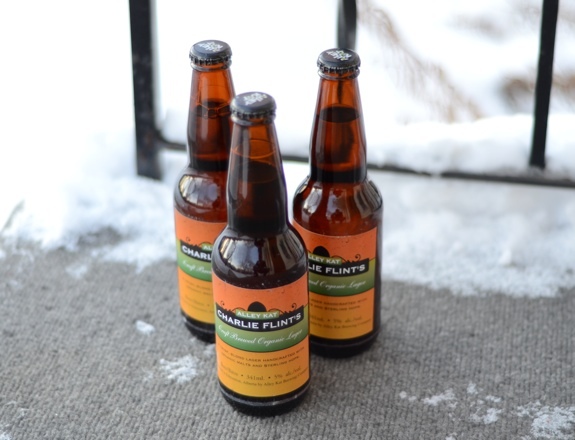 Not much colder than the beer that spent 45 minutes in the snow bank. Curious result. Pros/cons? : Chills bottles while hiding them from prying eyes. Requires extra effort, but somehow feels more Canadian. As for the difference between open-air and snow-bank results, my guess is that snow provides a degree of insulation, while the cold air in the previous test moves around the bottles, exchanging energy more efficiently. After 5 minutes: 6.4 C (43.5 F) — Not as cold as I thought it would be, but not bad. After 10 minutes: 4.2 C (39.6 F) — Colder still. Around fridge temperature. After 15 minutes: 0.2 C (32.4 F) — Holy crap, that worked well. At freezing point in only 15 minutes. Really refreshing. Pros/cons? : Uses salt, which isn’t free and feels really wasteful. Limited number of beers can be cooled at once. It’s effective at quickly cooling beer, but the cost and effort isn’t worth it if you can just leave your bottles outside for 45 minutes. So there you have it. One of the few reasons why your winter home in Palm Beach isn’t as awesome as a wintery Canadian apartment. Keep watch on the bottles to make sure they’re not freezing, and ALWAYS err on the side of caution. Nobody wants explosions. The colder it gets outside, the faster things cool down. Hide the beer in a place where wandering vagrants can’t find it. I’m not responsible for your results. Use this information at your own risk. Your chilling mileage may vary. 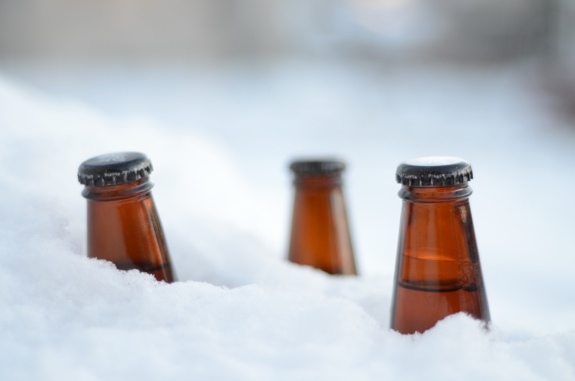 Chilling beer in a snowbank? Effective, but not necessarily as effective as leaving it in the cold air.